Huineng (慧能, 638 — 713) was a Chinese Chan (Chinese Zen) monastic who is one of the most important figures in the entire tradition. Huineng is the Sixth Patriarch of Chinese Chan Buddhism, as well as the last official patriarch. Since then, there are unofficial «patriarchs» of different lineages derived from Ch’an. In Japanese he is known as Daikan Enō. 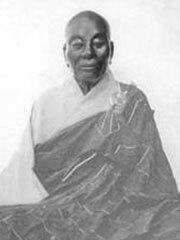 He is said to have advocated an immediate and direct approach to Buddhist practice and enlightenment, and in this regard, is considered the founder of the «Sudden Enlightenment» (頓教) Southern Chan school of Buddhism. While these are the legendary accounts handed down by the tradition, it is widely understood that the actual history of the situation may have been quite different, to the extent that most believe that the primary work attributed to Huineng, the Platform Sutra of the Sixth Patriarch (六祖壇經), which ended up becoming one of the most influential texts in the East Asian meditative tradition, has no true association with him. Huineng was born into the Lu family in 638 A.D. in Canton. His father died when he was young and his family was poor, so he did not have the chance to learn to read or write. One day, while he was delivering firewood to an inn, he heard a guest reciting the Diamond Sutra and he had an awakening. He immediately decided to seek the Way of Buddhahood. The guest gave him ten taels of silver to provide for his mother, and Huineng embarked on his journey. Thus began a remarkable page in Chinese Zen history. After traveling for thirty days on foot, Huineng arrived at Huang Mei Mountain, where the Fifth Patriarch Hongren presided. He asked Huineng where he was from and what he sought. Huineng replied that he was seeking nothing else but Buddhahood. Hongren then said that barbarians were from the south, therefore it may be difficult for him to achieve Buddhahood. Huineng counterreplied by saying that people may come from north or south, but the Buddha nature has no north or south. When the disciples saw this gatha on the wall, there was a great stir. When Hongrensaw it, he told them, «Practice according to this gatha, you will not fall into the evil realms, and you will receive great benefits. Light incense and pay respect to this gatha, recite it and you will see your essential nature.» All the disciples praised and memorized the gatha. Huineng then went back to rice pounding. However, this gatha created a bigger stir;everyone was saying, «Amazing! You can’t judge a person by his looks! Maybe he will become a living bodhisattva soon!» However, when the alarmed Hongren came out, he just casually said, «This hasn’t seen the essential nature either,» and proceeded to wipe the gatha off with his shoe. Hongren told Huineng, «If one recognizes the original mind, the original nature, heis called a great man, teacher of gods and humans, and Buddha.» He passed the robe and begging bowl as a symbol of the Dharma Seal of Sudden Enlightenment to Huineng.